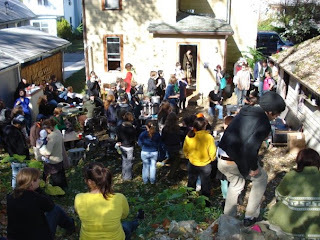 On a brisk, sunny October day, dozens of famished chili fans crammed into the backyard of “Brown Town,” a private residence at 35 Brown Avenue in Athens that plays host to community group the Action Committee. Lining the countertop of the estate's kitchen was an array of bean-laden and hearty concoctions, some 14 individual chili recipes in all. While it may have looked at first like a group of enterprising pals doing nothing more than ladling steamy stew, the “That's What's Up Chili Cook-Off” was in fact a community event whose obscurity was only rivaled by its creativity. Contrary to Athens mayor Paul Wiehl’s suggested belief, Brown Town was not chosen due to its unique position as a west-Athens "suburb," but because the event was hosted by the Brown Town-based Committee, a group devoted to community involvement and camaraderie through music and other artistic endeavors. 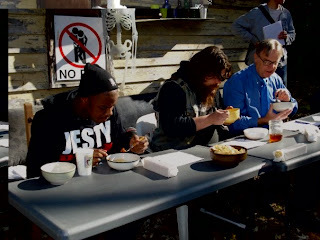 Andru Okun, one of the members of the group and a Brown Town dweller, helped organize the event, bringing in Wiehl and local musicians Jesty Beatz and Josh "Pencil" Hatfield as chili judges. In the end, two chunky, savory recipes were chosen as winners, one selected by the judges, the other selected by the nearly 80 attendants. Pulling in favor from the judges was Justin Cousino's entry, while the throngs of tasters opted for Piper Avalokita's tasty bowl. The event was considered an overwhelming success for the Action Committee, having enabled the group to raise an ample amount of funds through donations during the afternoon. Jesty Beatz even treated the sparse remainder of the audience to an impromptu performance after the judging and sampling was complete. 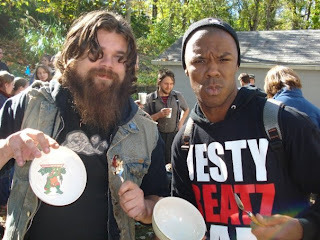 Judges Josh "Pencil" Hatfield, left, and Jesty Beatz came prepared with their chili bowls. The "That's What's Up Chili Bowl Cook-Off" crowd at "Brown Town"